The statistic represents the costs of electricity production in the United States between 2000 and 2014, by source. 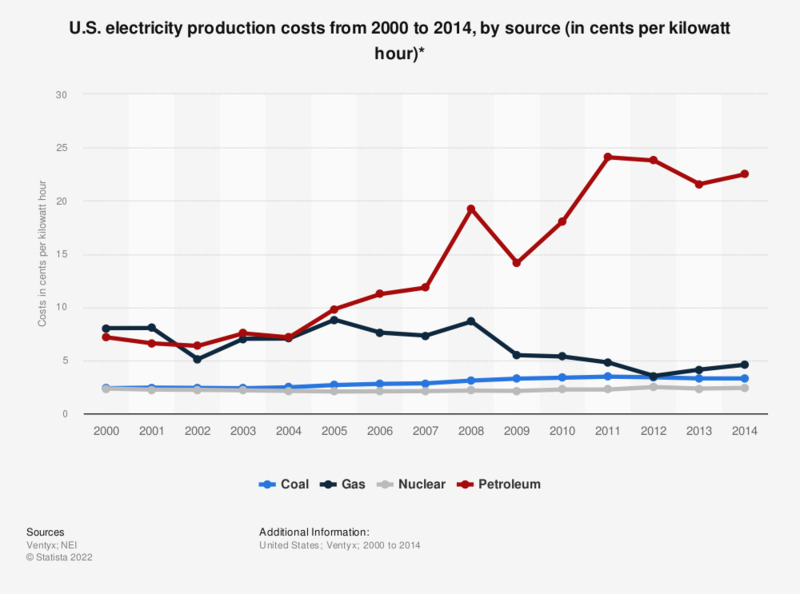 In 2014, the production cost of electricity generated from coal was 3.29 U.S. dollar cents per kilowatt hour. The average cost of electricity in the U.S. came to 9.43 U.S. dollar cents in 2015. * Values in 2014 U.S. dollar cents. According to the source, production costs equal the sum of operations and maintenance costs and fuel costs. Production costs do not include indirect costs and are based on FERC Form 1 filings submitted by regulated utilities. Production costs are modeled for utilities that are not regulated. According to the source, production costs equal operations and maintenance costs plus fuel costs. Total electricity sales in the U.S.